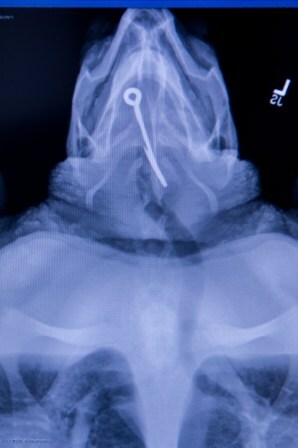 X-Ray shows 4" hook in Loggerhead's throat. 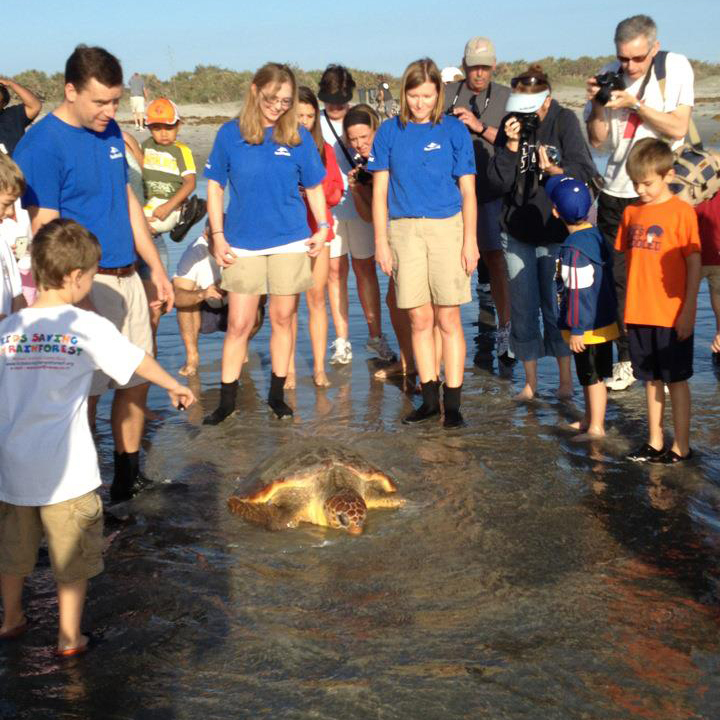 Four weeks ago a sub-adult Loggerhead turtle was found by biologists from the Inwater Research Group near the St. Lucie Power Plant in St. Lucie County, Florida. 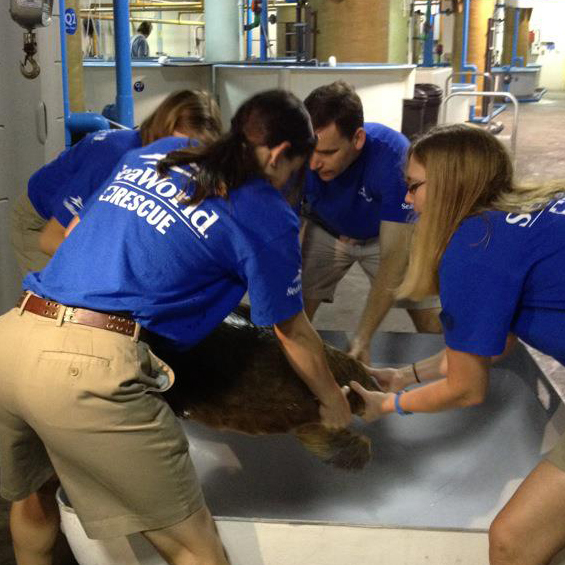 The 100-pound turtle was taken to SeaWorld, Orlando on February 26 with transport assistance from Inwater volunteers. Initial tests, bloodwork, and x-rays confirmed the need for immediate surgery. 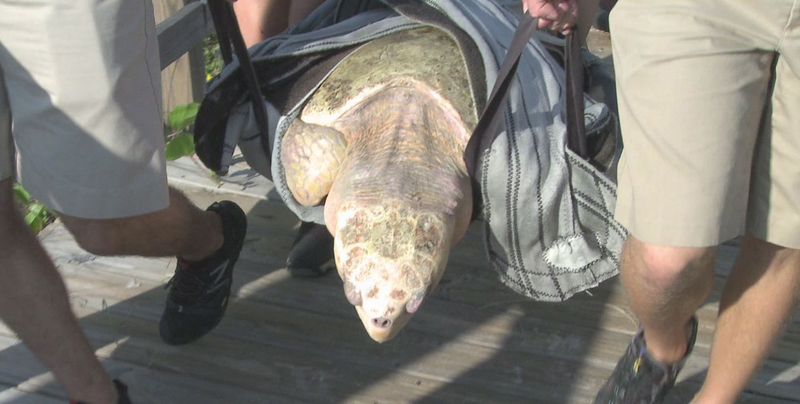 The turtle had ingested a 4-inch-long fish hook. Senior Veterinarian Dr. Lara Croft, one of three SeaWorld Orlando staff veterinarians, performed the surgery. 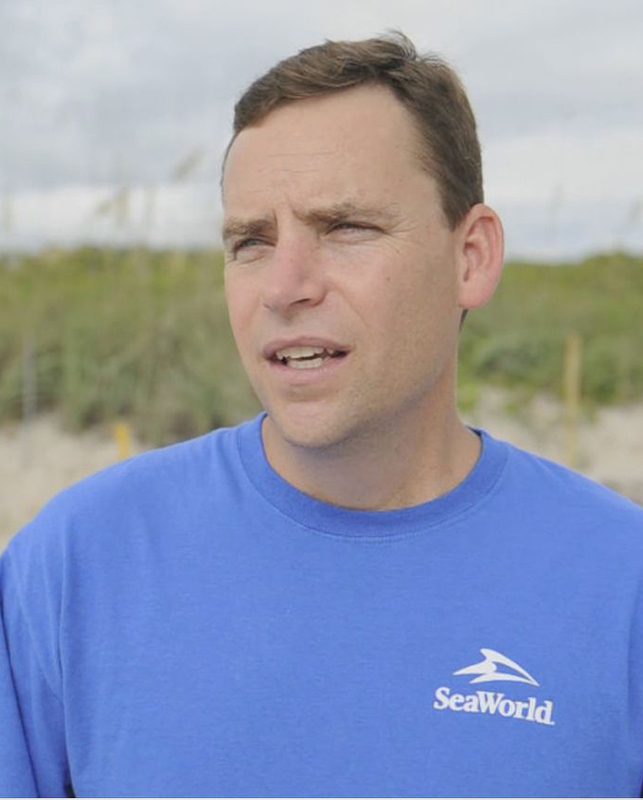 It was one of the largest SeaWorld veterinarians have removed. 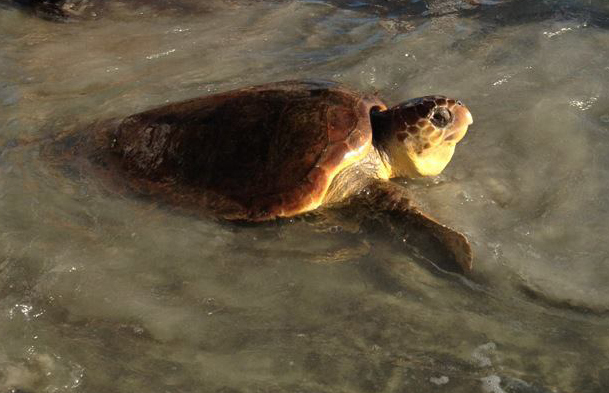 Showing remarkable resilience, the turtle has made a quick recovery. 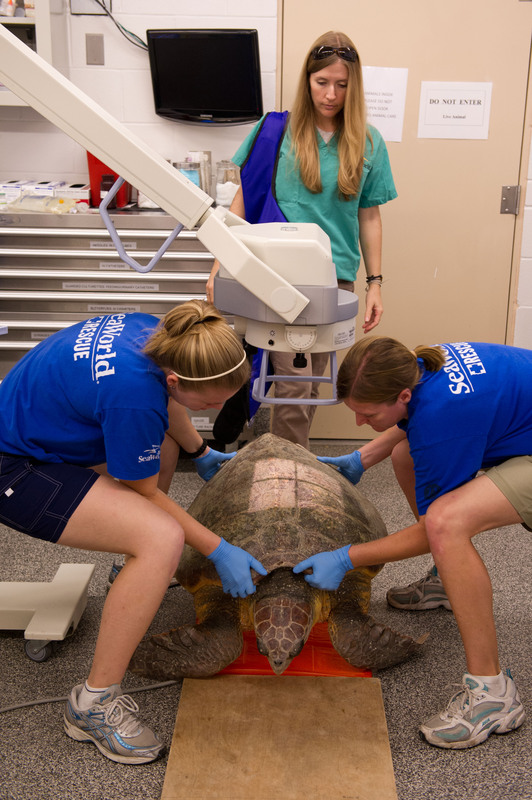 Dr. Croft watches on as aquarium staff members prepare the sea turtle for the x-ray procedure. 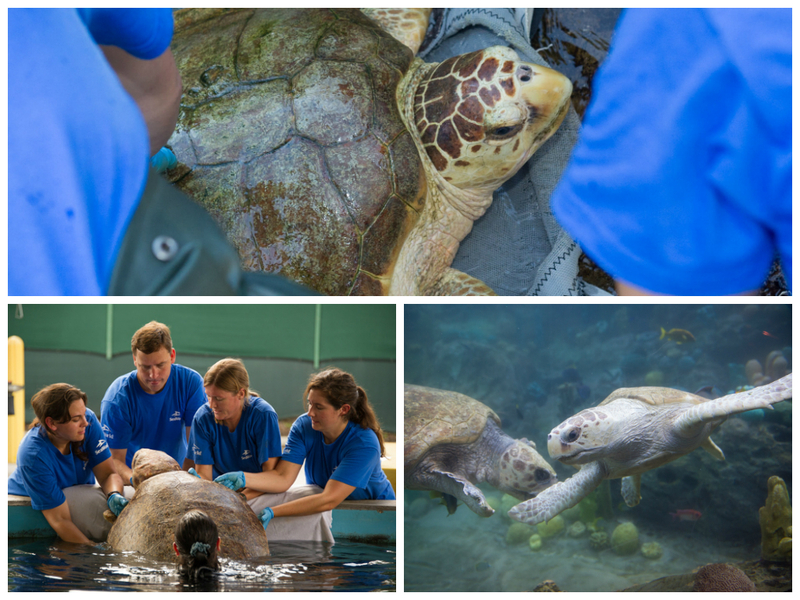 After a few short weeks of round-the-clock care, the turtle was deemed fit for release earlier this week. 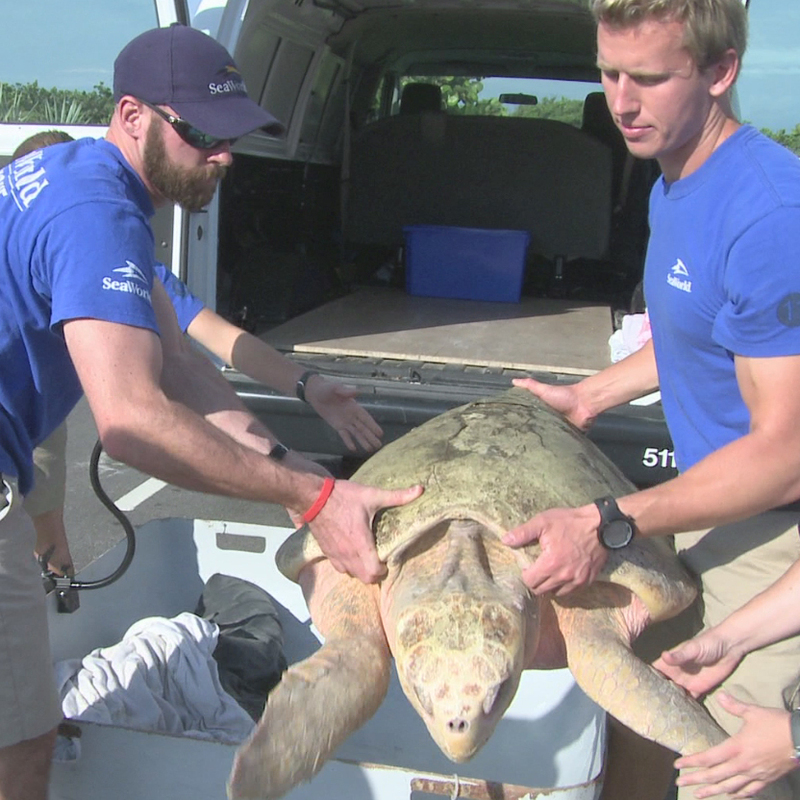 This morning, Dan Conklin, aquarium supervisor at Seaworld, and dedicated staffers carefully loaded up the turtle for the ride to the beach before 8 a.m.
At Lori Wilson Park, Cocoa Beach, the loggerhead got one last lift from his friends at SeaWorld as they carried it from the transport vehicle to the water. Peter Pan (as I’ve affectionately dubbed for his Hook-beating ways) moved steadily toward the water with many well-wishers around. At a little after 9 a.m. flippers could be seen darting through the waves as SeaWorld again helped an animal in need. 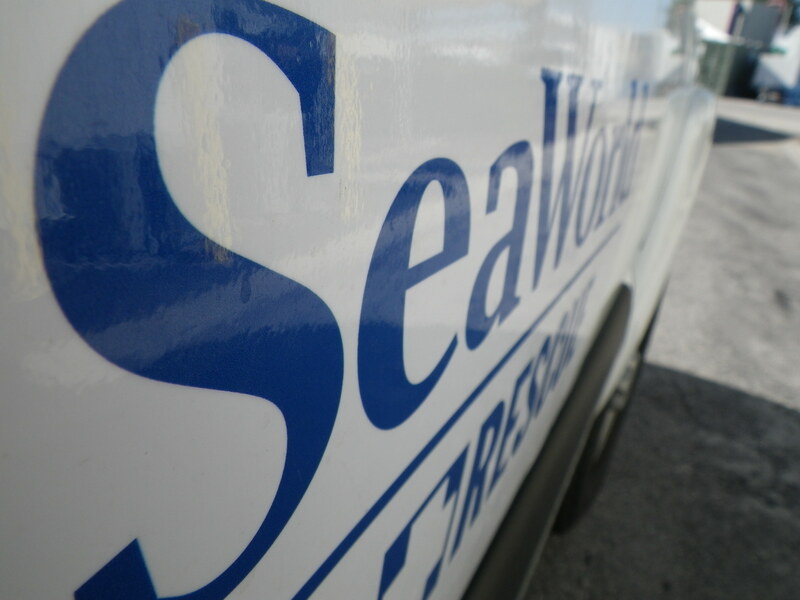 More than 20,000 animals have been rescued by SeaWorld experts. Their hard-working animal rescue team is on call 24 hours a day, 7 days a week. Peter Pan makes way for the surf. J-shaped hooks are easy for sea life to swallow, which is why anglers are urged to use the new “circle” hooks which are less likely to be ingested. Protect this and other threatened species by properly disposing of all trash, and securing fishing line that can also cause harm to our ocean friends. Love me, and all my Loggerhead turtle friends and sea buddies, by being responsible when you're on, or around, waterways. 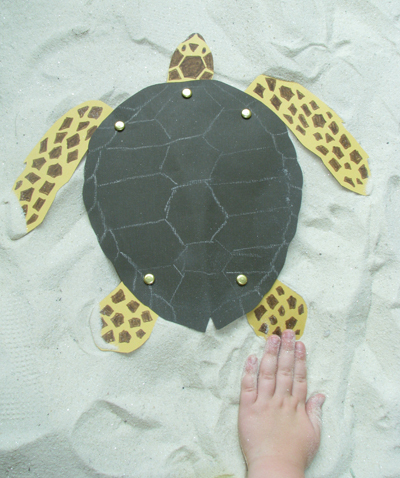 Celebrate the release by doing a Loggerhead craft! 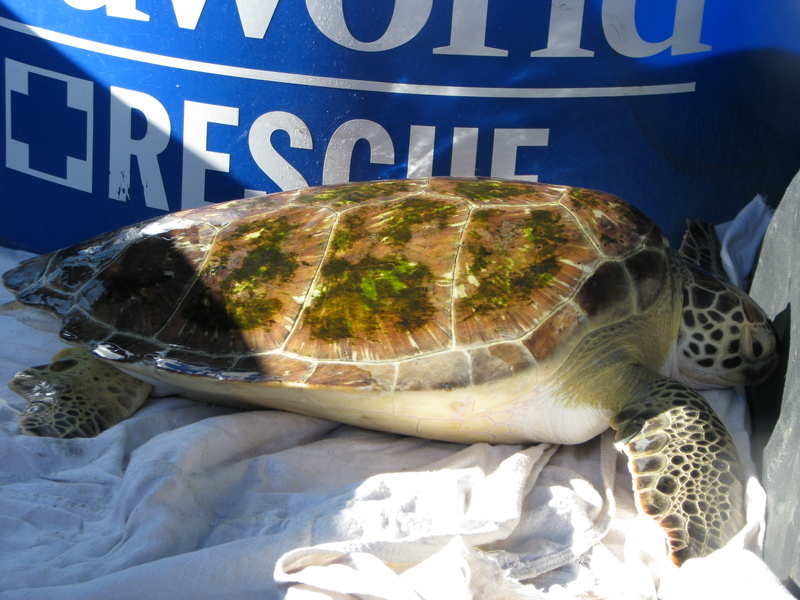 This is one of the many turtles rescued and rehabilitated by the SeaWorld team. I’m so excited that the sea turtle that had a 4-inch-long hook in its throat will be returning home to the waters of Cocoa Beach soon! Thank you SeaWorld and Inwater Research Group for finding and taking care of this beautiful animal and to the vets who removed the hook and helped it make a quick recovery! 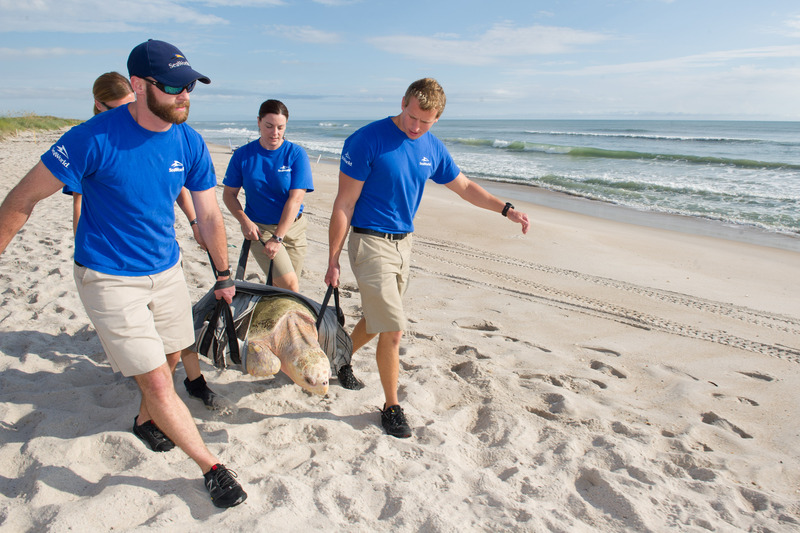 SeaWorld Rehab Teams Are Ready to Roll when and where an animal needs them. “The turtle, a sub-adult weighing approximately 100 pounds, was rescued from the intake canal at the St. Lucie Power Plant in St. Lucie County, Fla. The animal arrived at SeaWorld Orlando February 26 and immediately underwent surgery following x-rays and blood work procedures. 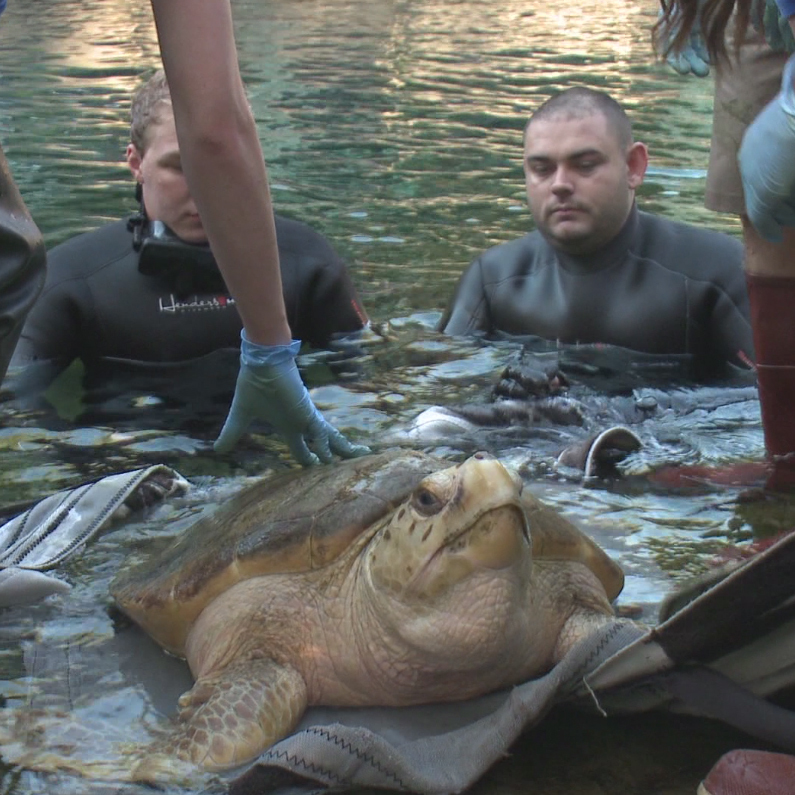 Vets removed a 4 inch-long fish hook, and after a speedy recovery, the turtle is now ready to be released back into the wild. 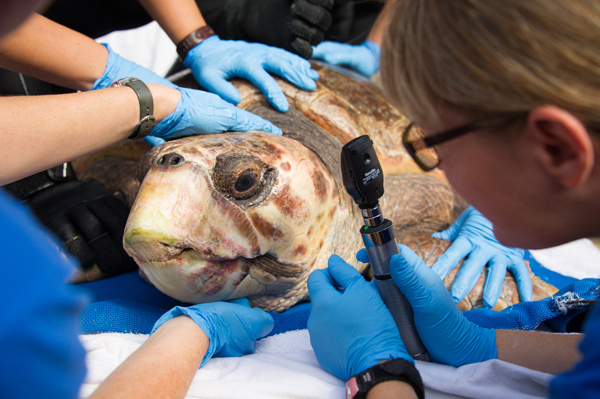 The loggerhead was found by the Inwater Research Group – an organization committed to the research and conservation of coastal species and habitats – who also assisted in the animal’s transport. According to SeaWorld veterinarians, the fishing hook was one of the largest the team has removed to date. To help protect this threatened species, make sure fishing line and all trash is disposed of properly. When fishing, use new “circle” hooks – turtles are less likely to swallow the circle-shaped hooks than traditional J-shaped, which cause suffocation or internal bleeding when swallowed. Also, if a sea turtle’s nest is seen, please contact authorities.